Glens of Antrim Potatoes was established in 1972 on the outskirts of Cushendall, County Antrim. 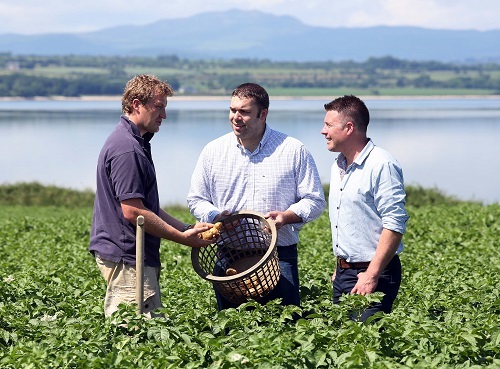 Their passion started from field to fork, growing and packing potatoes for retailers across Ireland. Glens of Antrim Potatoes are renowned for being a family favourite and trusted brand, recognised for quality and determination in growing and packing the finest produce, supplying all major retailers across Ireland. Alongside their extensive range of potatoes, they now do crisps – offering own brand and private label! Fancy something different – try their Sweet Potato Crisps or if you are a traditionalist – try their Thick Cut and Ridge Cut range. Glens of Antrim Sweet Potato Crisps are the perfect snack for all the Sweet Potato lovers! Available in a range of flavours – Mature Cheddar and Sweet Onion, Sea Salt and Cider Vinegar, Kickin’ Chilli and even Irish Whiskey, these Gluten Free crisps are worth a try! Glens of Antrim Thick Cut and Ridge Cut Crisps are hand-cooked in their skins to create a rustic texture. Across this range they currently have nine scrumptious flavours, all Gluten Free – Mature Cheddar and Sweet Onion, Sea Salt and Cider Vinegar and Gammon and Pineapple, to name a few. Their Ridge Cut range has Indian inspired flavours – Masala and Onion Bhaji. These crisps are deliciously moreish, the bold flavours, alluring, colourful premium packaging will have you grabbing more! Go on, give them a go!